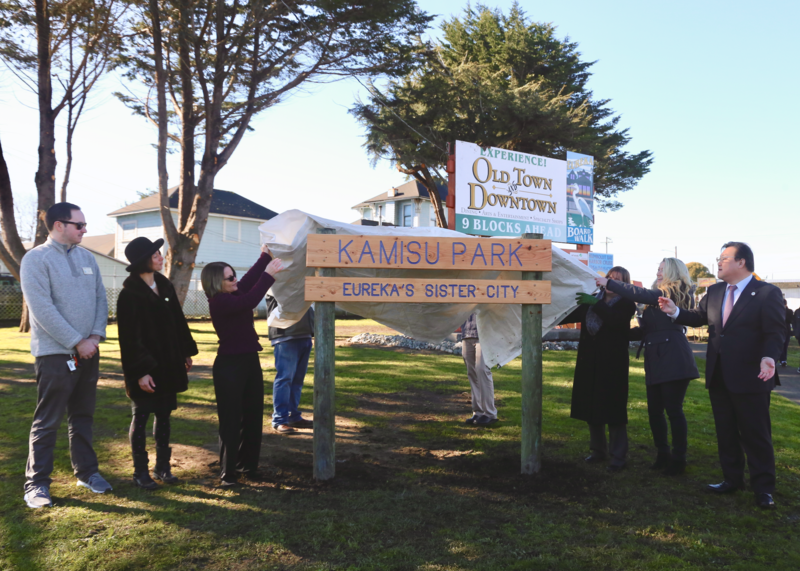 (PHOTOS) Say ‘Konnichiwa’ to Kamisu Park, Eureka’s Newly Dedicated Green Space! And just like that Eureka has a new park. This morning a few dozen people braved the cold to gather at the green lot located at the corner of Fourth and Q streets. There, officials representing both the cities of Eureka and Kamisu, Japan presided over a brief ceremony officially designating the area as Kamisu Park. Since 1991 Eureka and Kamisu have been linked through the Sister Cities International, an organization that aims to promote peace and understanding between peoples through cultural exchanges. Around the time the relationship was forged Kamisu officials planted a grove of redwood trees in their city. In turn, today’s dedication featured the planting of six Yoshino cherry trees from Japan. Eureka Mayor Susan Seaman thanked Kamisu officials for their city’s offering. Also in attendance today was Kamisu Mayor Susumu Ishida. Through a translator he spoke of the significance of his city’s gift to Eureka. “In Japan every cherry blossom season people get together [for a] picnic to drink, eat and sing karaoke under the trees,” Ishida’s translator proclaimed drawing laughter and approval from the crowd. Eureka officials planned to lead the Kamisu delegation to various points of interest around the city. The friendly vibes are set to culminate tonight at City Hall where the Eureka City Council will declare today to be “Kamisu Day” during the regular meeting. Photos from today’s event below. Please be gentle with these, Eureka. If you are, you will be rewarded.